Passive transfer studies have demonstrated that specific antibodies against PRRS virus are capable of protecting animals from homologous challenge. However, the role of NAs in the course of infection is a controversial issue. While some authors have reported a certain correlation between the appearance of NAs and the cease of viraemia or the clearance of the virus from lungs, other studies have suggested that for some strains, clearance of viraemia can occur without NAs; even more, viraemia and viral replication can persist even in the presence of NAs. In relation to cell-mediated immunity, some studies have reported that IFN-γ may be associated with viral clearance in the absence of NAs. 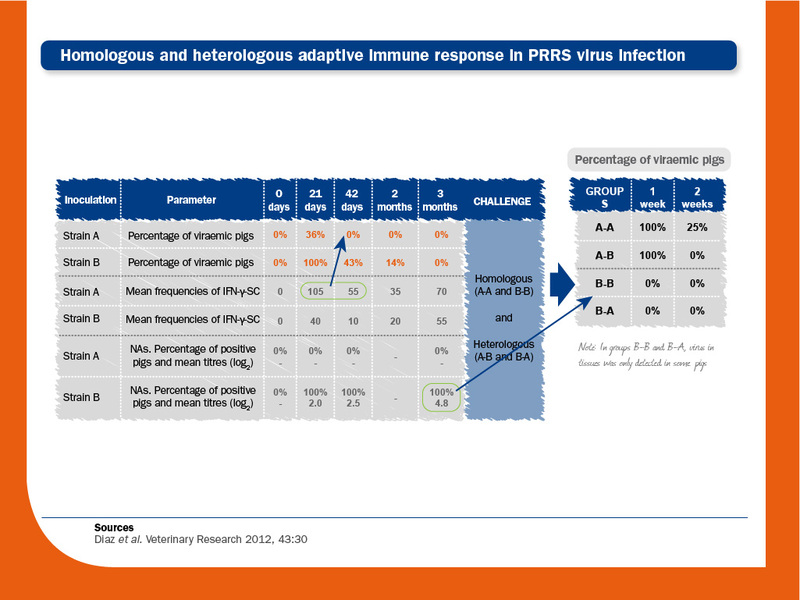 As has been widely discussed, levels of NAs after PRRS virus infection/vaccination are usually low or nil. Indeed, NAs effectiveness is limited against heterologous isolates since cross-neutralisation (neutralisation of a given strain by NAs induced by another strain) can be low even between similar strains. It seems that cross-neutralisation may not be strictly related to the sequences and/or number of glycosylations of known neutralising epitopes in GP3, GP4 or GP5; this has led some authors to claim that other, yet unknown, neutralising epitopes could exist. Nevertheless, although exceptions exist, it seems that the higher the amount of NAs, the better protection against re-infection. In terms of cell-mediated immunity, several studies have related higher frequencies of IFN-γ-SC, in the absence of NAs with clinical and virological protection. This phenomenon has been described in sows and in piglets in terms of protection against reproductive and respiratory failures, respectively. However, it is important to point out that as seen for the NAs, resolution of viraemia can be achieved even without apparent development of IFN-γ-SC. Some studies have demonstrated that pigs with low IFN-γ-SC responses after vaccination can be protected from a PRRS virus challenge if high levels of NAs are present. Two groups of piglets were vaccinated (vaccine A and B) and challenged (Ch strain). As expected, vaccinated piglets did not develop NAs. In this situation, IFN-γ-SC was most likely the main protecting mechanism against infection. Genetic identity between the structural proteins of the vaccines (A and B) and the strain used in the challenge (Ch) was above 90%; however, it was higher between vaccine A and Ch (98.3-99.7%) than between vaccine B and Ch (92.3-98.6%). Interestingly, in this case, heterologous strain (B) provided better protection than the homologous one (A). According to the authors, this fact could be explained by the ability of each vaccine to induce PRRS virus-specific IFN-γ-SC. Source: Díaz et al. (2006). 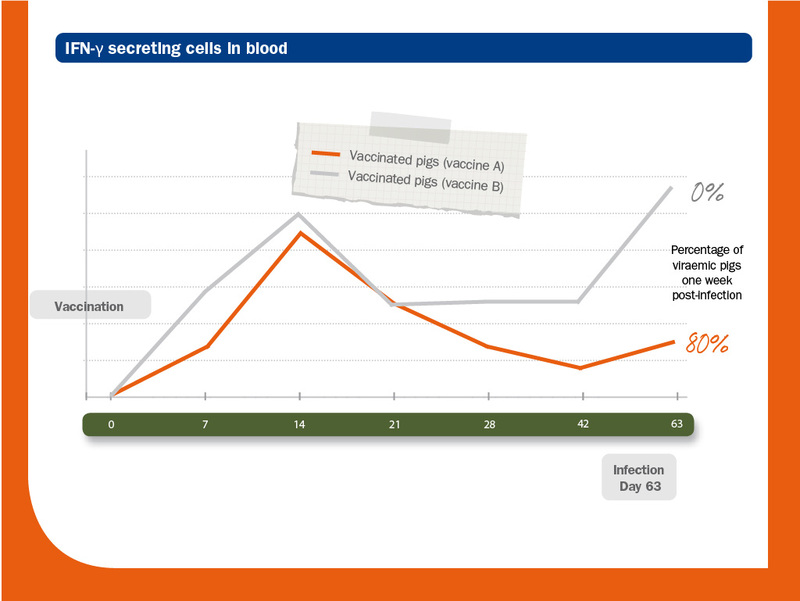 Vaccinated piglets were not completely protected against infection, but the disease had a less severe course. Interestingly, higher clinical scores and viraemia were observed in low PRRS virus-specific IFN-γ-SC responders. Source: Martelli et al. (2009). In order to investigate the significance of each compartment in protection against PRRS virus, the homologous and heterologous immune responses in PRRS virus-infected piglets were characterised. One group of animals were first inoculated with PRRS virus strain A and three months later they were challenged with either strain A or strain B (A-A and A-B) and followed-up for the next two weeks. Another group of pigs were inoculated with strain B and challenged at three months as above (B-B and B-A). Viral clearance after infection. In animals inoculated with strain A, viraemia ceased in the absence of NAs. In animals inoculated with strain B, viraemia was longer and sustained, and coexisted for weeks with NAs. Therefore, the role of NAs in clearing viraemia could be considered as limited. Regarding cell-mediated immunity, strain A induced the highest frequencies of PRRS virus-specific IFN-γ-SC. Since NAs were not detected in this group of animals, it would indicate that PRRS virus-specific IFN-γ-SC was responsible for the viral clearance. Protection against re-infecion. After re-infection, virus was not detected in blood from animals previously inoculated with strain B (B-B and B-A). Some of them were actually infected, since virus could be detected in tissues after either homologous (B-B) or heterologous challenge (B-A). However, infection in these pigs was at lower intensity than in A-A and A-B animals. Therefore, as opposed to viral clearance, preformed NAs play a role in protection against re-infection. Again, since strain A did not induce NAs production, but induced the highest frequencies of PRRS virus-specific IFN-γ-SC, it would indicate that cell-meditated immunity could be responsible for limiting the duration of viraemia and the spread of the virus to the tissues when NAs are not present. Overall, the results of this study suggested that “preformed NAs may have a protective role against infection, but animals devoid of detectable NAs may limit the spread of infection, thus indicating that cell-mediated immunity probably also contributes to protection”.